The city of Draper, Utah, is set against the Wasatch Mountain Range about 20 miles south of Salt Lake City. Just off the highway in southwest Draper is a low-slung red brick structure owned by Dale T. Smith & Sons Meat Packing Co. In February 2013, animal rights advocate Amy Meyer stood outside the company’s building, filming what appeared to be a bulldozer moving a sick cow, according to a statement she later filed in court. Meyer was arrested and charged with violating Utah’s “agricultural operation interference” law, becoming the first person prosecuted in the U.S. under what detractors call state “ag gag” laws. In July, because of Meyer’s challenge, a federal trial court struck down the Utah law as unconstitutional. A host of supporters and critics of such laws are closely watching what happens next in both the Utah case and in a similar Idaho case pending before a federal appeals court. Observers say the cases will help determine whether other states will join the nine, including Utah and Idaho, that have statues allowing criminal or civil cases against those who carry out undercover operations at animal production facilities. Or, instead, if the animal rights, environmental and other groups who challenged the Utah and Idaho laws will broaden their efforts to challenge the laws in all of the states. Advocates say the laws are necessary to protect animal producers’ property rights, and safeguard their business reputations from slanted, one-sided portrayals. Opponents, meanwhile, say the state statutes shield bad behavior against animals, threaten food safety and violate free speech. 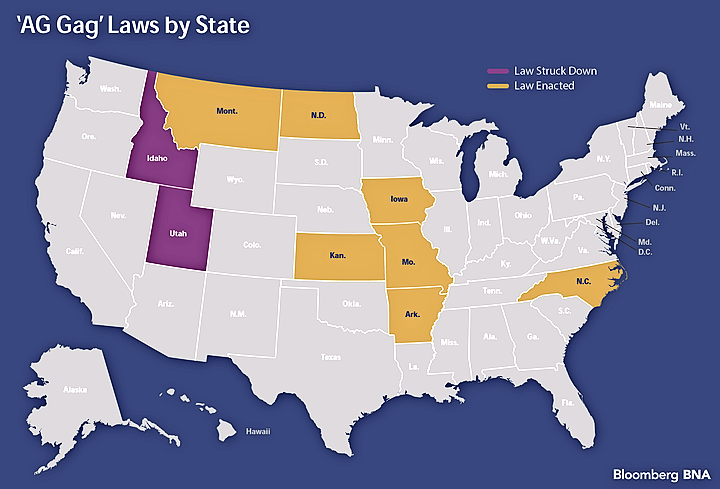 Utah’s law was enacted in 2012 in response to increased videotaping and other activities by animal rights groups at animal production facilities across the U.S. The law, similar to several other state statutes put into place over the past five years, makes it a crime to gain access to an agricultural site under false pretenses, and bars electronic eavesdropping, obtaining a job as a pretext for filming, and filming while trespassing. Although the charges against Meyer were dismissed, she filed a civil rights action against the state in July 2013, joined by the Animal Legal Defense Fund, and the People for the Ethical Treatment of Animals ( Animal Legal Defense Fund v. Herbert, D. Utah, 13-cv-00679). On July 7, 2017, a federal trial court in Utah ruled in favor of Meyer, striking down the law under the free speech provision of the First Amendment. The Utah decision was the second trial court to strike down such a statute, after a federal court in Idaho in August 2015 found a similar law unconstitutional on its face. That case also was brought by the ALDF, along with the American Civil Liberties Union and several other plaintiffs ( Animal Legal Defense Fund v. Otter, D. Idaho, 14-cv-104). An appeal in the Idaho case has been argued before the U.S. Court of Appeals for the Ninth Circuit which, sources say, should soon issue a ruling. When it does, the Ninth Circuit will become the first federal appeals court to rule on the constitutionality of the state statutes ( Animal Legal Defense Fund v. Wasden, 9th Cir., 15-cv-35960). The office of Idaho Attorney General Lawrence G. Wasden and advocates for the agricultural industry argue the laws should be allowed to stand. “The legislature knew that agricultural production facilities had been the focus of malicious property destruction and that an undercover investigation had resulted in death threats to a blameless Idaho dairy owner and employees,” the state said, without providing specific details about the event. “It was entirely rational to respond with legislation that extends additional property protection to that sector,” the brief said. The state argues the lower court erred by rejecting the attorney general’s reliance on the significance of the agricultural sector to Idaho’s economy as one justification for the law. But, in 2015, a federal judge in Idaho, like the judge in Utah who issued the July ruling, found the law violates First Amendment free speech rights. “The expansive reach of this statute is hard to reconcile with basic speech, whistle-blower, and press rights,” Judge B. Lynn Winmill of the U.S. District Court for the District of Idaho said. “Criminal and civil laws already exist that adequately protect those interests without impinging on free-speech rights. It is already illegal to steal documents or to trespass on private property,” Winmill said. “In addition, laws against fraud and defamation already exist to protect against false statements made to injure or malign an agricultural production facility,” the court said. “Suppressing broad swaths of protected speech without justification, however, is not one of them,” Shelby said. In addition to constitutional questions, the Ninth Circuit also has been asked to consider the impact of the Idaho law on both animal welfare and food safety. “Despite laws … that prohibit cruelty to animals, as well as federal regulations requiring withholding of bacteria- and disease-ridden animals from the food supply and pasteurization of dairy products, the meat industry regularly violates these laws,” the Food & Water Watch, a Washington-based environmental group, said in a friend of the court brief filed in the case. The group, in its brief, cites foodborne illness associated with industrial agriculture as a growing threat to public health, and says the mistreatment of animals, including the slaughter of sick downer cows increases the risk of salmonella and other foodborne illnesses. The brief argues that undercover operations can reveal food safety issues and drive reform. As one example, the group cites Department of Agriculture revisions to its regulations related to downer cows. FWW attributes that change to a 2007 Humane Society investigation and videotape showing mistreatment of animals at the Hallmark/Westland Meat Packing Co. plant in Chino, Calif.
That investigation, it said, led to the recall of 143 million pounds of meat—the largest recall of its kind in U.S. history. “There is an overlap between how animals are raised and slaughtered and the risk of disease to humans,” staff attorney Cristina Stella with The Center for Food Safety in San Francisco told Bloomberg BNA. But industry advocates see it differently. They point to the importance of the state statutes in enforcing animal producers’ property rights, as well as protecting their reputations from out-of-context, biased video footage. Statute proponents, which include state agricultural groups as well as national organizations like the U.S. Poulty and Egg Association, also said the laws actually help protect against, not further, food contamination. Undercover activists pose a threat to biosecurity by concealing their employment history, according to a friend of the court brief filed in support of the Utah law by Animal Agriculture Alliance, Protect the Harvest, and State Agricultural and Rural Leaders. The groups advocate for agricultural interests in the state. “These individuals often work at multiple agricultural operations across the country in succession,” the brief said, creating the “risk of carrying pathogenic diseases” that may be spread from one facility to another. In addition, the groups said, undercover animal rights advocates “do not have an incentive to stop lapses in animal welfare or food security.” Instead, they argued, such advocates allow animal abuse to occur in order to film it rather than intervening to stop it. Avian flu is one example of a pathogen that could be spread by undercover activists, the groups’ attorney, John Dillard with Olsson Frank Weeda Terman Matz PC in Washington, told Bloomberg BNA. “Undercover activists may work at a site for two weeks or a month and then pick up and move on,” Dillard said. Diana R. H. Winters, assistant director of scholarship at the Resnick Program for Food Law & Policy at UCLA Law, told Bloomberg BNA that the impact of the state laws on food safety is difficult to quantify. “The largest beef recall in U.S. history came about in 2008 because of an undercover investigation into slaughterhouse practices, but there is no hard data on whether permitting undercover investigations actually reduces the incidence of foodborne illness,” she said. “And in a perfect world, problems with food safety should be fixed through other mechanisms (USDA/FDA inspection, self-regulation, etc. ), but of course it’s not a perfect world,” Winters said. Kansas became the first state law to put into place legislation protecting animal production operations from undercover surveillance when, in 1990, it enacted the Farm Animal and Field Crop and Research Facilities Protection Act. Montana and North Dakota enacted similar statutes the following year. Increased activism and videos by animal rights advocates in the late 2000s, including the 2007 Humane Society investigation at the Hallmark/Westland site, led to bankruptcies and the closure of facilities and criminal charges against employees and owners, the District of Utah said in its opinion. Ballot initiatives followed and Iowa, in 2012, became the first state to enact an anti-surveillance statute in two decades. Utah and Missouri quickly followed suit. “The second round of laws came in response to new investigations by groups like Mercy for Animals and Humane Society,” Matthew Liebman, director of litigation for ALDF in Cotati, Cal., told Bloomberg BNA. Mercy for Animals, another animal rights group, in 2014 released a video of workers using a tractor to drag a cow on the floor by a chain around its neck, and workers beating, kicking and jumping on cows. The Idaho Dairymen’s Association responded by drafting that state’s law, the Idaho federal judge said in his August 2015 decision. Then came statutes in North Carolina and Arkansas. While most of the laws are criminal statutes, the North Carolina and Arkansas laws are civil, allowing private parties to pursue damages. Many of the more recent statutes were drafted with the assistance of the American Legislative Exchange Council’s 2004 model legislation. “These bills met a need to counter a wave of domestic terrorism,” Michael Bowman, vice president of policy at ALEC told Bloomberg BNA. Dillard, who represented the agricultural groups weighing in on the Utah case, says the recent rulings in the Idaho and Utah cases will likely give pause to other states considering enacting similar laws. Meanwhile, the Animal Legal Defense Fund’s Liebman said that, while he is pleased with the Utah and Idaho rulings, the fight has just begun. Oral argument was held in the Ninth Circuit on May 12, and a ruling is pending. The state has until Sept. 6 to file a notice of appeal in the Utah case. A spokesman for Utah Office of Attorney General Sean Reyes declined to comment.